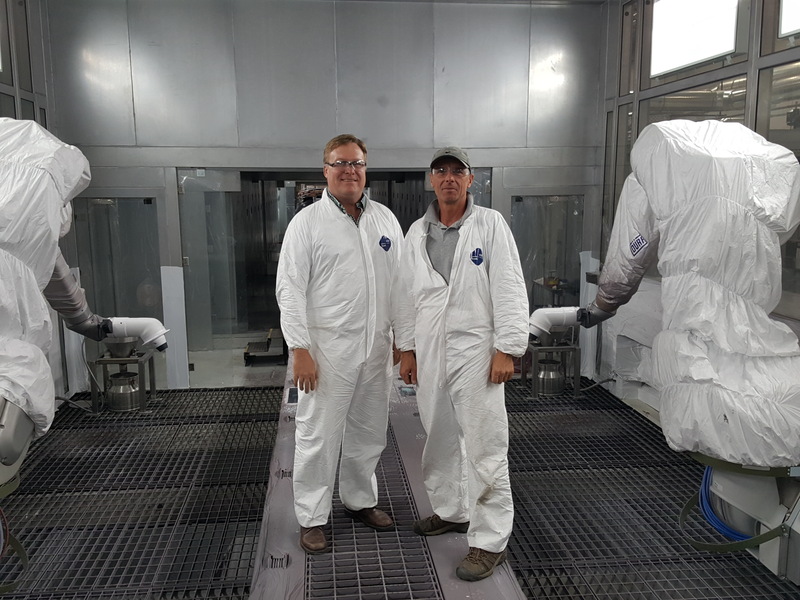 Industrial applications for gas-fired humidifiers are almost endless, as demonstrated by a recent large installation at Karma’s Automotive. 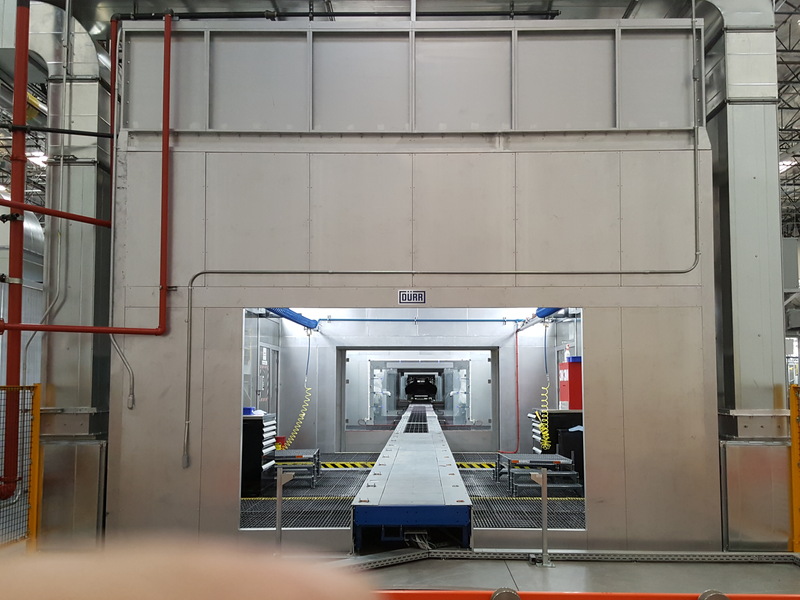 The hybrid car manufacturer operating out of Moreno Valley, California incorporated a large gas-to-steam humidification system from Q Applied Systems as part of their new $55 million paint room at its Moreno Valley manufacturing facility for their Revero a hybrid that uses electricity, gas and solar power to run. Today’s controlled environment in many industries often requires the use of a humidification system in order to ensure product quality, eliminate static buildup and improve indoor air quality. Larger controlled areas often require larger humidification systems. Gas-to-steam humidification has become a cost effective option when considering options. Informed decisions are often based on control tolerances, compatibility with the HVAC system, fuel utilization, first cost and operating costs. 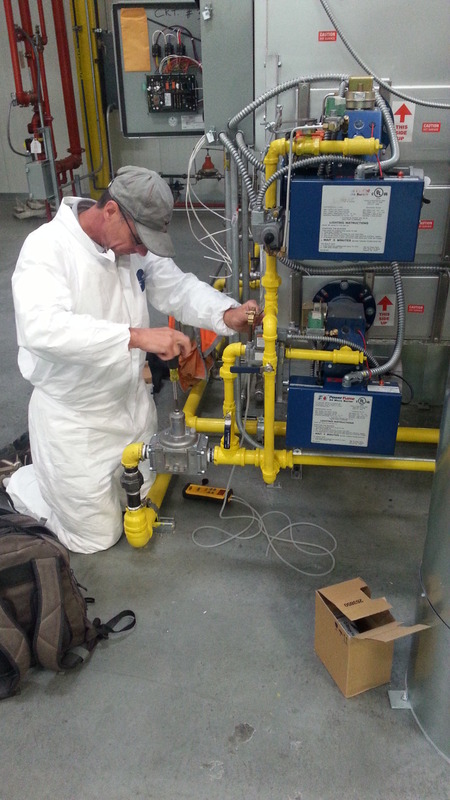 With these metrics, gas-to-steam humidification will often be considered for a project. Electric-to-steam humidifiers offer very fine control but larger systems usually have much higher operating costs. Using traditional pressurized boiler steam can offer a lower installed cost but is either not available in a building or is treated with unwanted chemical inhibitors that are potentially entrained in the airstream. Atomization systems are worth considering but are sometimes difficult to integrate into a cold air duct system, face resistance from end users or prohibited in applications such as hospitals. While these systems do offer certain advantages, the improved controllability and energy efficiency has made natural gas and liquid propane a practical solution to large humidification systems such as those offered by Q Applied Systems an excellent alternative. As previously mentioned, the main issue associated with the use of central plant boiler steam humidification is the potential for chemical additive carryover that can impact air quality. 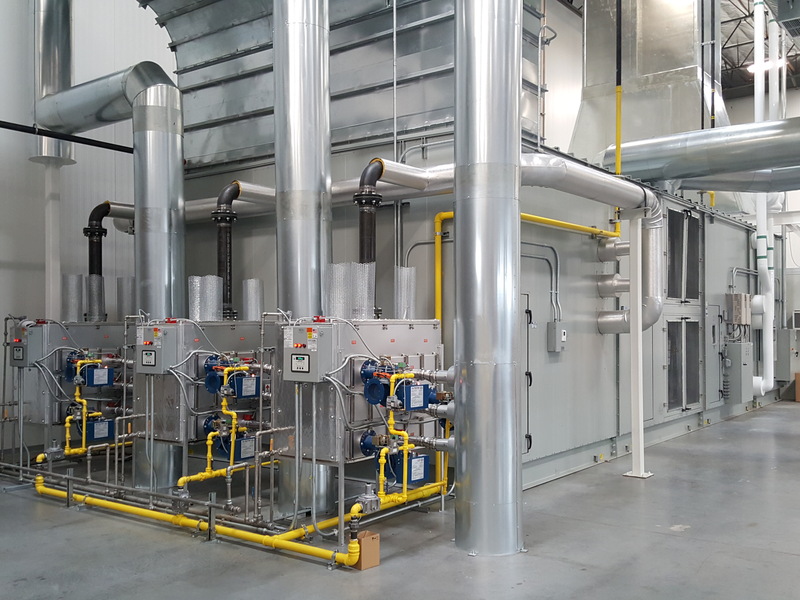 Users who want to consider central plant steam as a fuel source can consider first passing it through a heat exchanger or un-fired boiler to produce a clean source of steam. Such issues are not present when using gas-fired humidifiers as minerals are left behind in the tank and don’t carry over into the airstream. They can also utilize reverse osmosis or deionized make-up water to eliminate mineral build-up and to provide a higher level of controllability. Thus, when using a large gas-to-steam humidification system, you can be assured that steam supporting the air quality is pure. 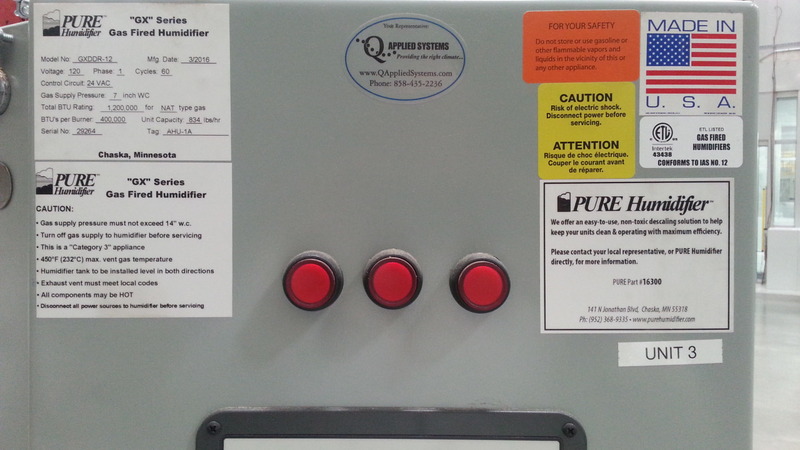 Q Applied Systems represents a variety of humidification options including gas, electric, steam and high pressure atomization systems. In the consideration of large systems, electric humidifiers are often not the best solution due to the connected load required and operating costs. Electric-powered humidifiers do offer comparable benefits when it comes to the quality of steam that they produce, yet that may come at a higher operating price. Still, operating costs are not always the primary driver and electric humidifiers are useful for very fine control applications, smaller zones or limitations of other fuel options. Another advantage is the ability to manifold together multiple humidifier tanks into a single large gas-to-steam humidification system for even greater costs-savings on top of the already low prices of fuel sources. Add-on features like outdoor weatherproof enclosures, Modbus BACnet or LonWorks communication gateways, variable air volume humidity controller and reservoir thermocouple water temperature controls. Today’s technology allows providers like Q Applied Systems to offer solutions such as a large gas-to-steam humidification system to meet the user’s stringent needs with improved energy efficiency overall best cost. Q Applied Systems is a manufacturers’ representative of HVAC and moisture control equipment and systems as well as fume and dust collection products throughout Southern California and Baja Mexico. We specialize in the application of engineered systems and equipment for commercial and industrial markets. Applications include pharmaceutical, hospital, biotech, high-tech, manufacturing, and other specific processes that require engineered products. To learn more about our services, capabilities or to discuss your project or application call (858.435.2236) or through our contact page.